Our business hours are mon-sat: 10:00 am-06:00 pm and sun 12:00 pm-05:00 pm. More about us: main street on the harbor, 111 main st., 35 quaint historic grist mill & park, wetlands ``discovery'' cruises and educational & cultural organizationinsured. Assisting customers in english. Our products and services include 35 quaint specialty shops and 7 eateries, accommodates 299 people, unique 8,800 sq. ft. facility, wetiands 'discovery' cruises and wetlands 'discovery' cruises. Accepted forms of payment are american express, debit cards, discover card, mastercard, personal checks and visa. We offer service in and around residential and commercial. Stonybrook Village Center can accomodate a lot of people that visit the place. It is a great place where you can go and relax, as well as get some educational information that can turn out to be really interesting. We went there as a family for a Saturday trip and we were excited by the scenery and the lovely hospitality that everybody showed us. There is a nice cafe nearby where you can enjoy cheap and tasty delicacies and really good coffee. History has always been my thing, so I totally loved the place! 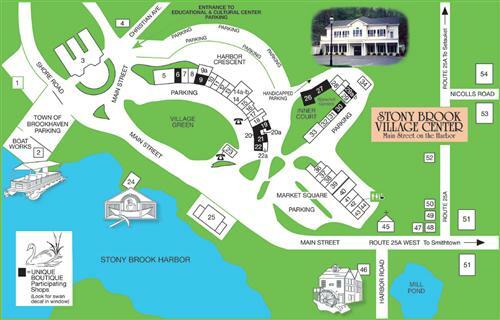 When you need to get away of the city center, Stony brook Village Center is an idyllic place to go and have fun. You can relax by strolling up and down the village park, take a look at beautiful species of butterflies and birds, as well as some rare plants, fully colored and perfumed. The place is perfect for educational excursions and trips for young students, where they can enjoy getting in touch with the nature and all of its beauty. Just walking around the Stonybrook Village Center offers a nice afternoon, but they offer so much more for you to experience. Make a day of it at Stonybrook Village center with the kids, they'll be sure to enjoy it. Do you have any experience using Stonybrook Village Center? If so, please rate your experience and let others hear about it using the form below.